It is confirmed that 42-year-old actress Charlie Young (楊采妮) is five months pregnant with her first child with husband Khoo Shao Tze (邱韶智). Charlie’s close friend, Gigi Leung (梁詠琪), also confirmed the news. Despite being in a high-risk pregnancy, Gigi reassured the press that Charlie is well, and is excited to be a new mother. Charlie married Khoo Shao Tze, a Singaporean businessman, in November 2013. Dating since 1997, the couple faced bumps in their relationship that led to a break-up of 7 years. 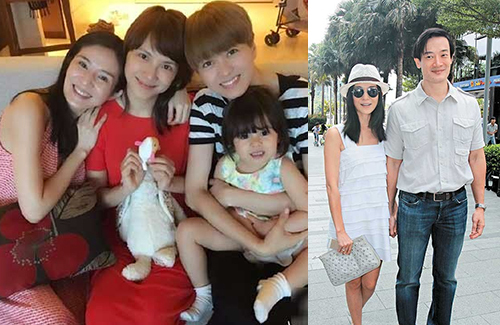 On New Year’s Day, close friends Gigi Leung and Angelica Lee (李心潔) flew to Singapore to spend the holidays with her. In a group photo they shared online, Charlie covered her belly with a cushion, leading to pregnancy speculations. Charlie’s manager confirmed on Monday that the actress is already five months pregnant. Congratulations to Charlie and Shao Tze!